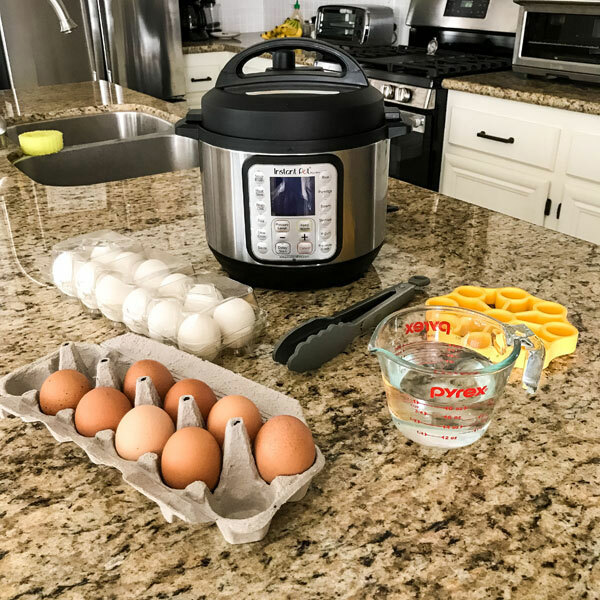 Instant Pot Mini Hard Boiled Eggs are the perfect beginner recipe to learn how to use your new multi-cooker. 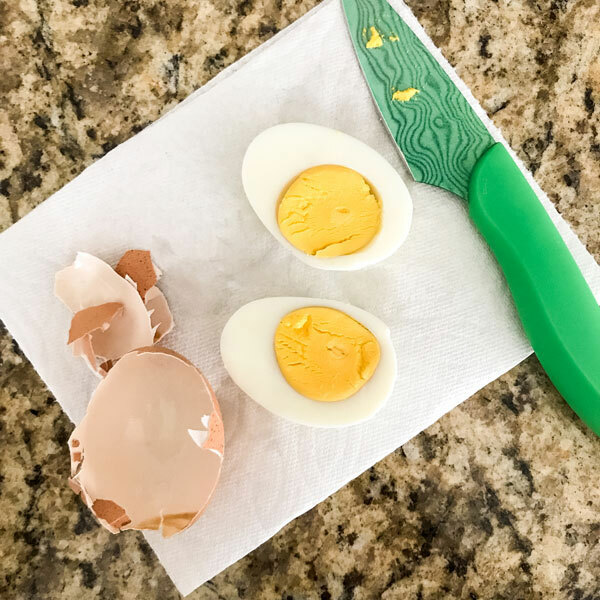 The easy-to-peel eggs are great as a quick high-protein snack or for making egg salad. The secret to a good Sriracha Egg Salad Sandwich starts with good hard-boiled eggs. 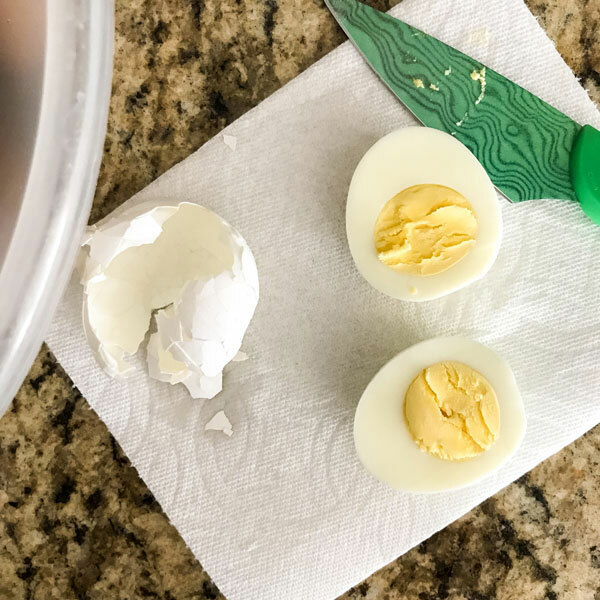 I’m talking creamy yolks (with no grey in sight) and easy to peel shells. 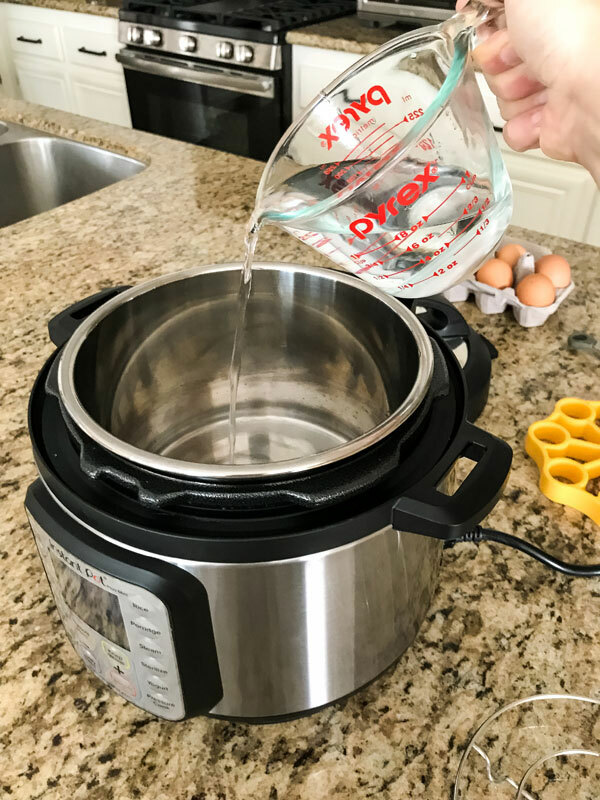 If you’ve struggled with achieving these results using the traditional stovetop method you’ve got to give it a try in your 3 quart instant pot mini. 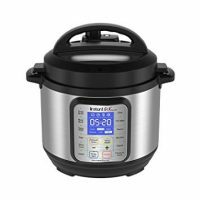 Last year we added a new member to our small appliance family, a 3 qt Instant Pot Duo Plus Mini. After reading the manual we couldn’t wait to cook something with it and settled on a batch of hard-boiled eggs. Looking online and in the IP Books I’d checked out of the library I found about 100 different methods. 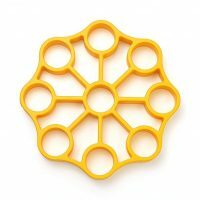 The most popular is something called the 5-5-5 Method. We gave it a try using 2 eggs and ended up with overcooked grey yolks and cracked egg shells. Skimming through the 5-Ingredient Vegetarian Pressure Cooker Cookbook, I noticed the author had a different version that used low pressure for 6 minutes followed by a quick release. So I grabbed 2 more eggs and gave it a try. The whites were perfect but the yolks were a tiny bit overdone. On the next batch, I kept the pressure low but reduced the time to 5 minutes. This time, the eggs were perfect. 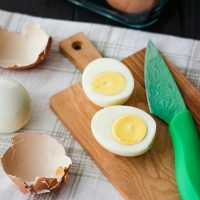 For any method/time combination, I’d suggest cooking just one or two eggs the first time you try it. 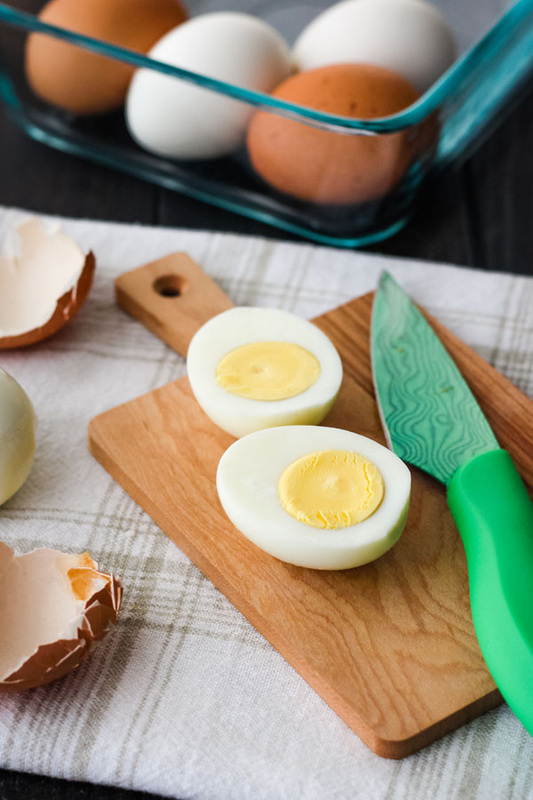 Make perfect easy-to-peel hard cooked eggs in just 25 minutes! 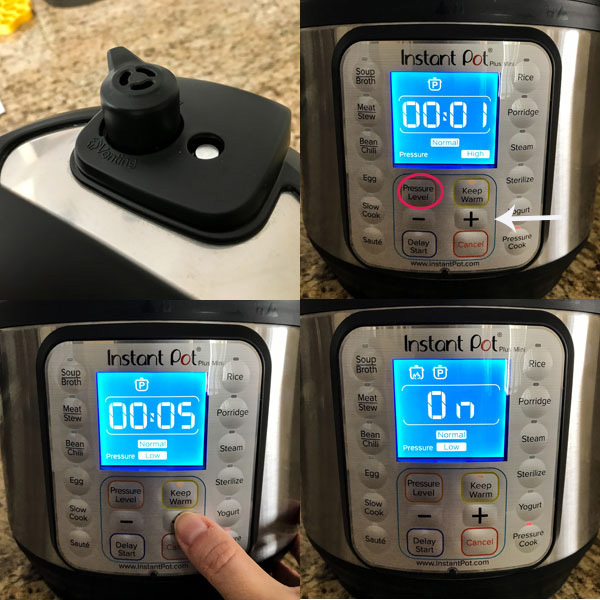 Pour the water into the inner pot of your 3 qt Instant Pot. 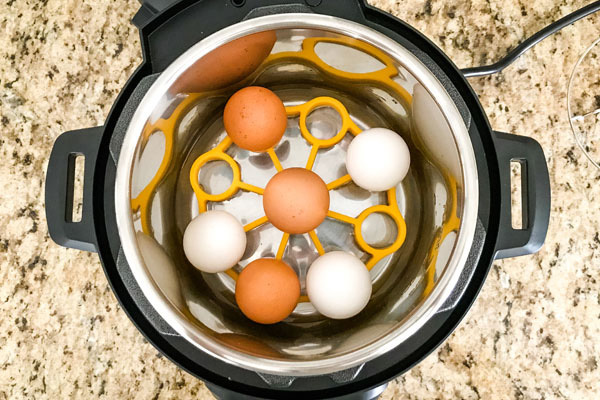 Place the rack that came with your pressure cooker in the bottom of the pot and arrange your eggs on top of it. Close and lock the lid. 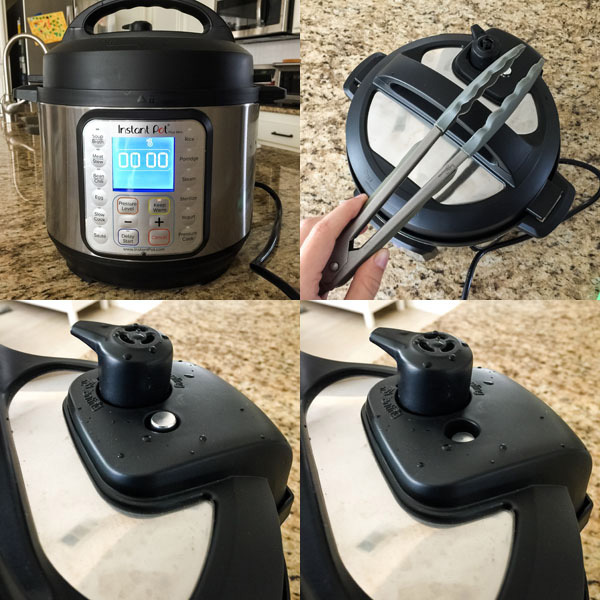 Make sure the steam release handle is pointed toward the Sealing position. When the cooking time is up, manually release the pressure using a Quick Release. Once the float valve has dropped down, carefully open the lid turning it away from you as you lift it up. 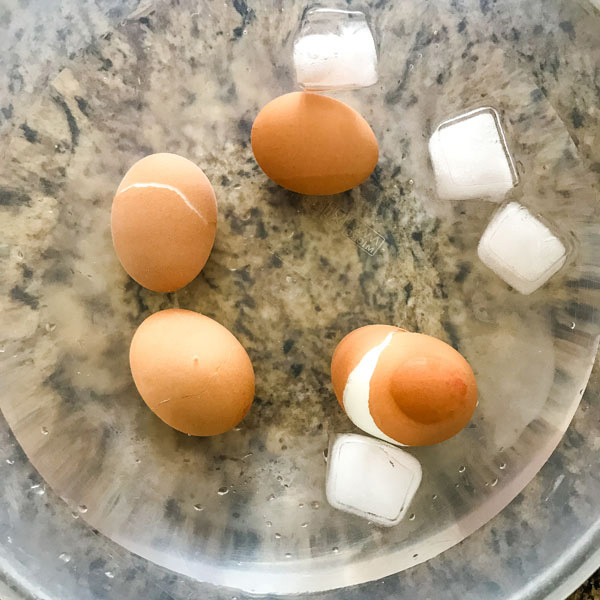 Remove the eggs and place in a bowl of ice cold water for at least 5 minutes. Peel and enjoy right away or store in your fridge for up to one week. Recipe developed using a 3 Quart Instant Pot Duo Plus. 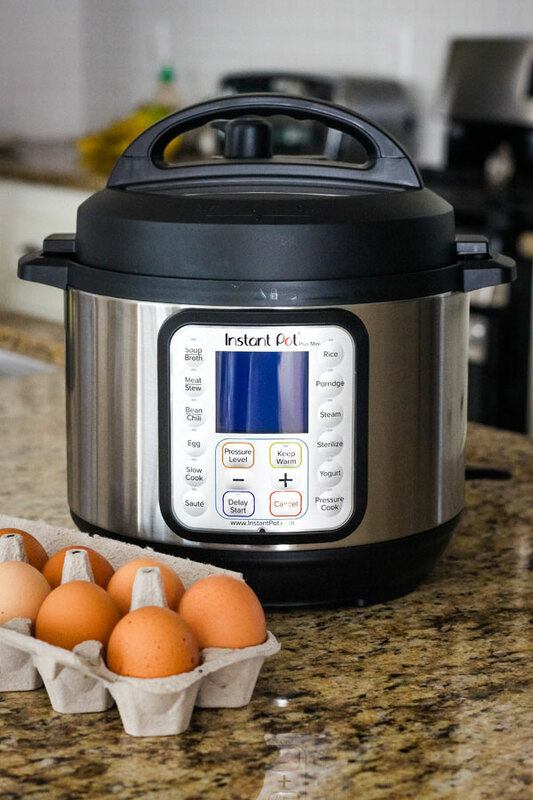 Start by pouring 1 cup of water into the bottom of your 3 quart Instant Pot. Next, place a rack in the bottom. The other day, I found a nifty OXO Silicone Egg Holder in the discount section at our local Ralph’s. I don’t know about you but the Manager’s Special area is just irresistible! I really like how it keeps the eggs from rolling around and have used it when cooking other rolly-polly shaped things like these instant pot mini beets. If you’re interested in getting one for making your eggs, it’s available on Amazon. You can also use the metal rack that came with your mini pressure cooker. We’ve cooked with both and have not had any problems. Once you’ve got your rack in place put the eggs on top of it. Turn the top vent knob towards the Sealing position. Then place the lid on top and turn it to lock your pressure cooker. Listen for a beep that will tell you the lid is properly in place. Press the manual or pressure button. Adjust the pressure to low by pressing the “Pressure Level” button. Use the minus/plus (- +) buttons to set the time for 5 minutes. Wait for a few seconds, it will beep, the screen will switch to read “On” and the machine will begin cooking. 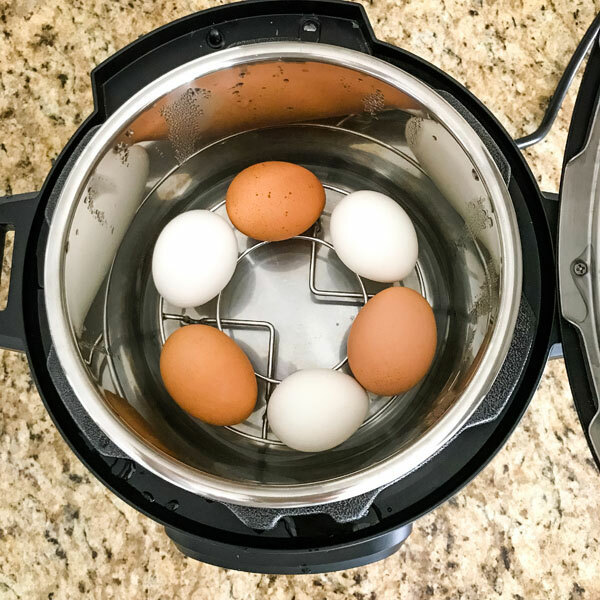 It usually takes about 10 minutes for our 3 quart instant pot to come to pressure when cooking eggs this way. While the eggs are cooking fill a bowl with ice and water. The machine will beep once it reaches pressure and will start counting down the time on its screen. Once it’s finished cooking, it will beep again and the screen will have zero minutes on it. Carefully “quick release” the steam by using tongs to turn the vent knob into the venting position. Watch out for the escaping steam. When the metal thing (technically called a float valve) goes down press cancel to turn off the machine. Then carefully remove the lid and place it in the holder on the side of the machine if you want. 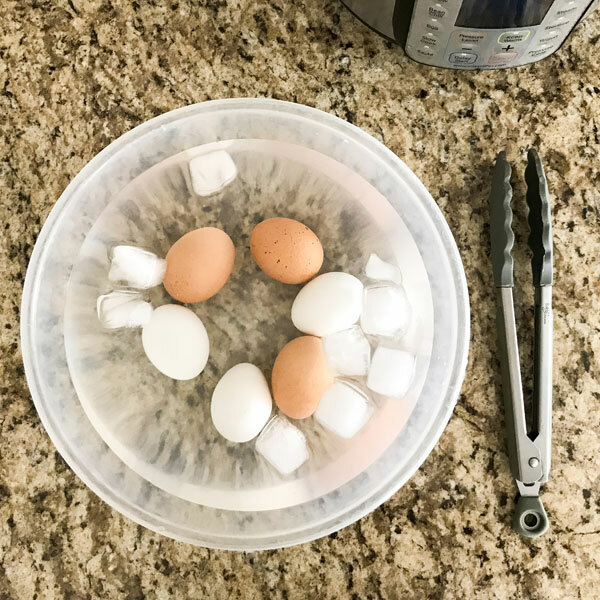 Use tongs to transfer the eggs to the bowl of ice water and let them sit in the ice water for at least 5 minutes. 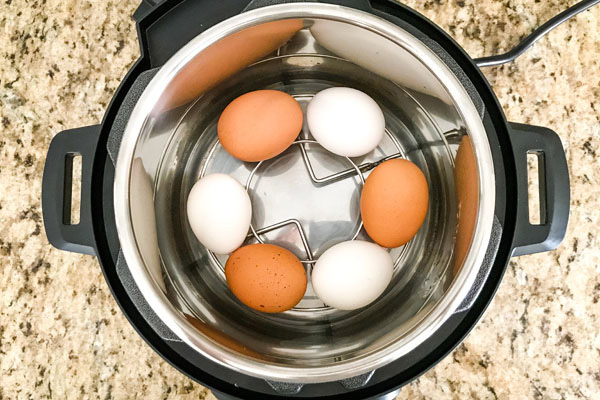 Can you make a dozen eggs in an Instant Pot Mini? 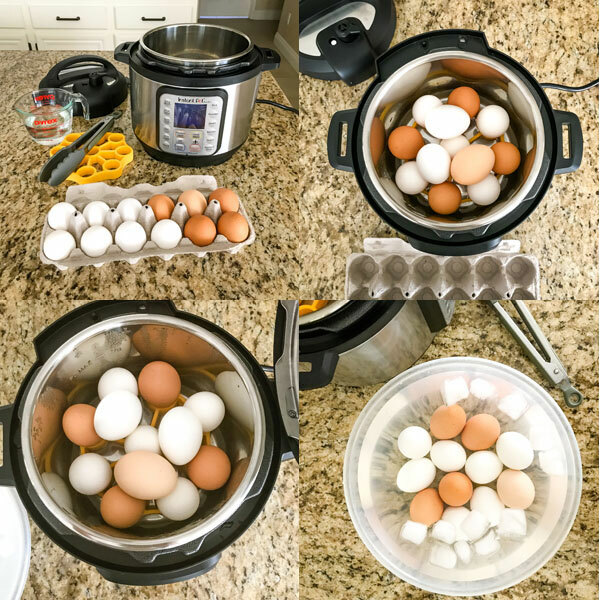 Curious, we poured 1 cup of water into our 3 Quart Instant Pot Duo Plus, added a rack, and piled 12 large eggs on top of each other. I had to move a few of the eggs around so the pile was under the Max Fill Line on the inside of the pot. Keeping everything the same as the recipe above, we cooked them on Low Pressure for 5 minutes, used a Quick Release, and chilled the eggs in ice water for at least 5 minutes. Note: The machine did take more time to come to pressure, about 13 minutes. 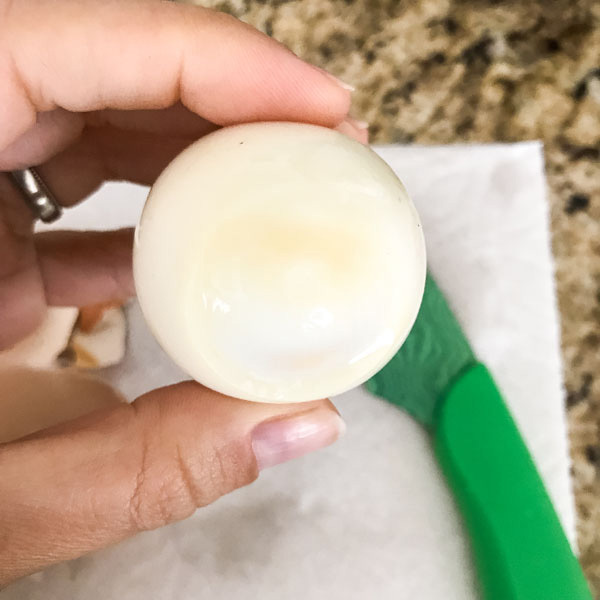 The results: 2 eggs had small cracks and a few of the eggs that were closer to the bottom of the pot had a light brown area on the whites from the shells. Otherwise, they were delicious and incredibly easy to peel! 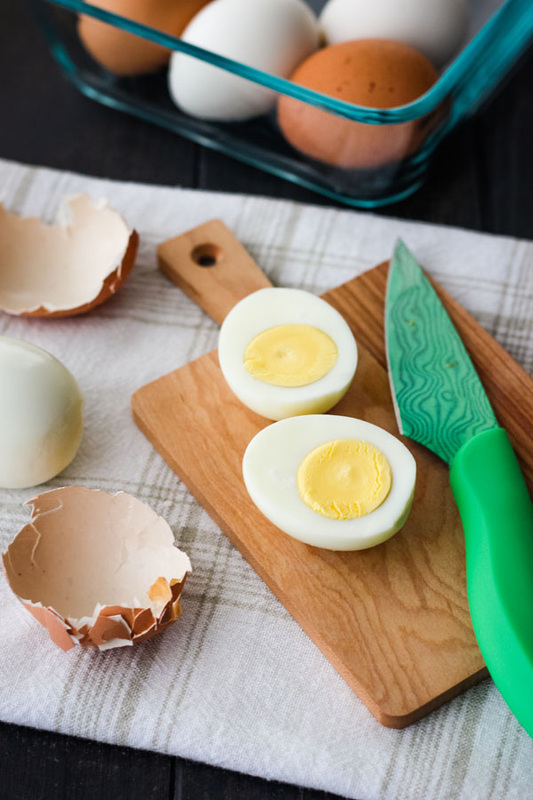 Make sure your pot is cool and that you are using cool (not hot) water, otherwise your eggs will crack and be overcooked. This happened to a batch we cooked when the pot was still warm from cooking another recipe.